Made another test video to see how the Phone Poncho would fare when exposed to a leisurely day at the beach. Here’s the situation: You’re at the beach with your family, and you decide to go for a walk down the shoreline before lunch. You bring your phone with you in case something comes up. While you’re gone, the fam decides that they want Del’s Cheesesteaks for lunch and call to get your order. You’re taking the phone out of your pocket to answer when – OH NO – it slips and falls into the sand! If sand gets into the headphone jack or dock connector, it will be a huge pain in the neck to try to get out, and could do some serious damage to your very expensive iPhone! Instead, stop being a cheapo, shell out the $10 bucks, and get a Phone Poncho!! For the most part, I’d like to say that once you get one its pretty self explanatory. However, for the curious cats out there – here’s a video demonstrating how it works. 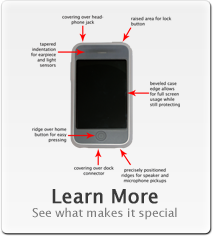 Remember, even though all of the phone is covered (except the screen), you can still make phone calls through the case! 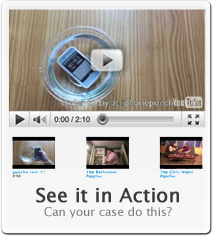 Performed our first test this morning on a prototype case…check it out! The phone was wrapped in saran wrap since I didn’t want to ruin a phone on the first test. The case actually performed better than I expected, letting in only a tiny bit of water even though it was submerged fully for over 45 seconds! 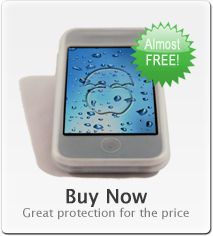 I should say here that the Poncho is not designed to protect an iPhone when it is thrown in the water, but I was curious to see what would happen. Thus: DO NOT TRY THIS AT HOME!